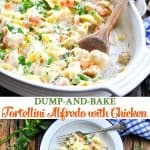 This Dump and Bake Tortellini Alfredo with Chicken and Veggies is an easy dinner recipe with just 5 minutes of prep! You don't even have to boil the pasta before it goes in the oven! 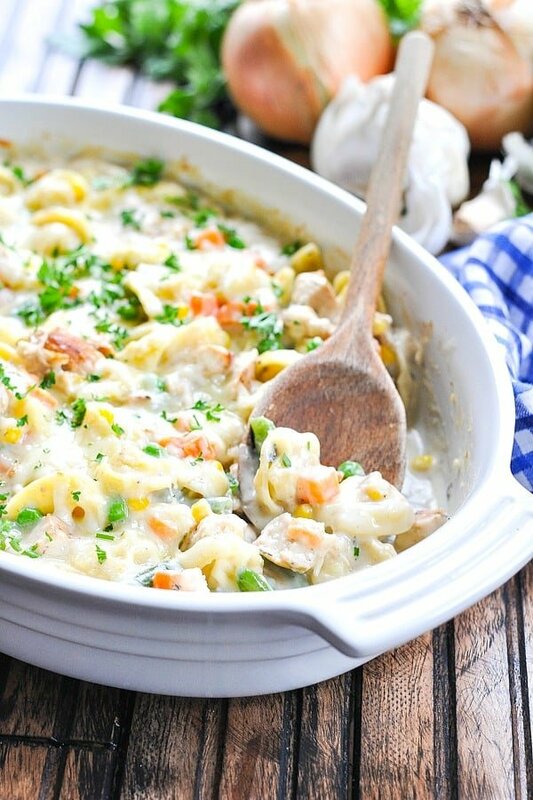 This Dump and Bake Tortellini Alfredo with Chicken and Veggies is an easy dinner recipe with just 5 minutes of prep! You don’t even have to boil the pasta before it goes in the oven! 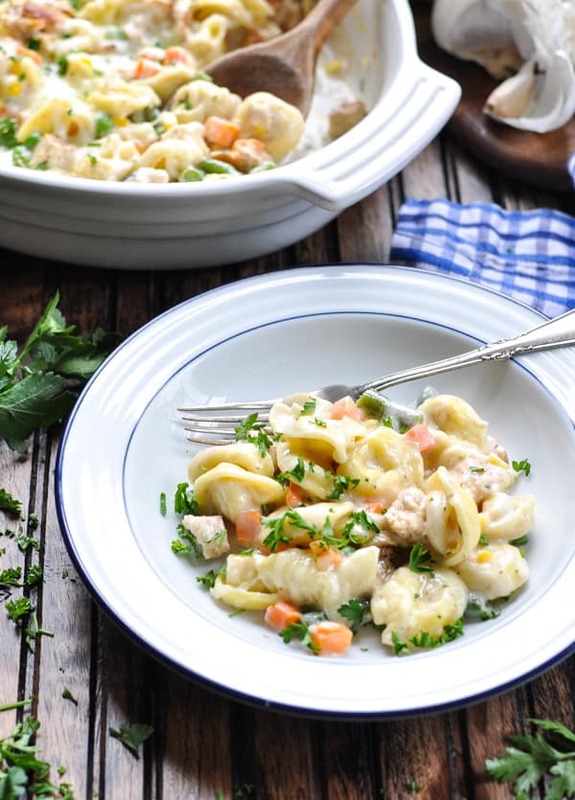 You can never have too many chicken tortellini recipes — especially one like this that comes together in just one dish! 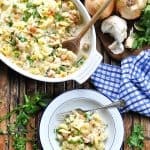 This baked Tortellini Alfredo is particularly special because the pasta bakes right in with the creamy sauce. 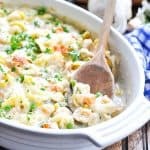 You’ll stir the chicken and the frozen vegetables into the casserole at the end of the cooking time (so that they don’t get too mushy), and finish it off with a sprinkling of cheese on top. I don’t know about your house, but that’s a weeknight dinner that my whole family can agree on! 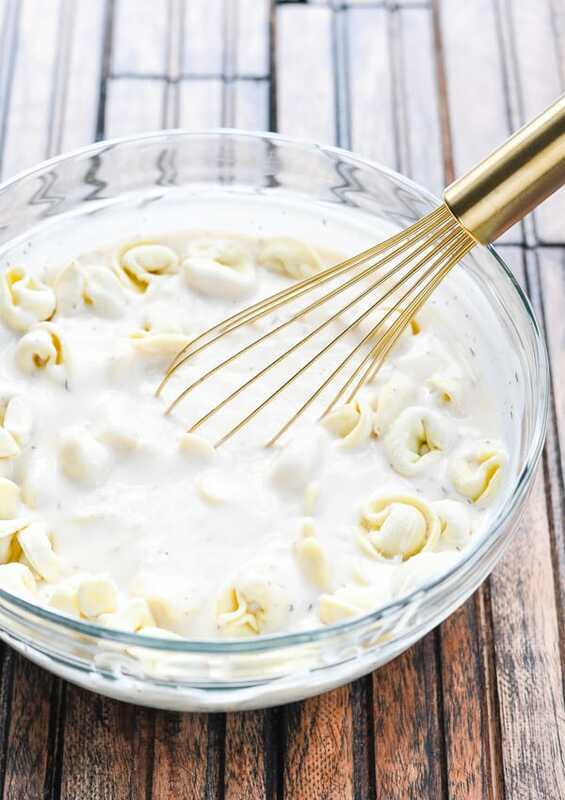 How do you make Tortellini with Alfredo Sauce? You know I love a good dump-and-bake dinner, because mealtimes are chaotic enough. 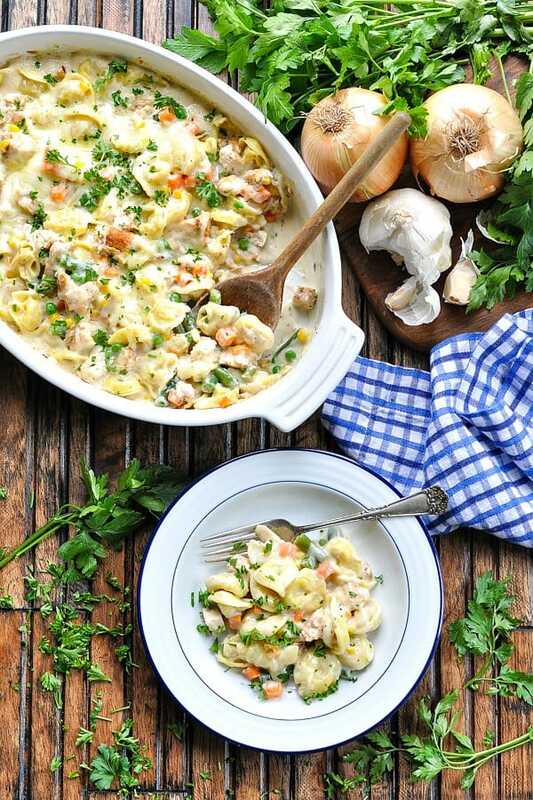 If it’s simple, it’s a winner — and this Tortellini Alfredo is no exception. First, let’s start with the pasta. 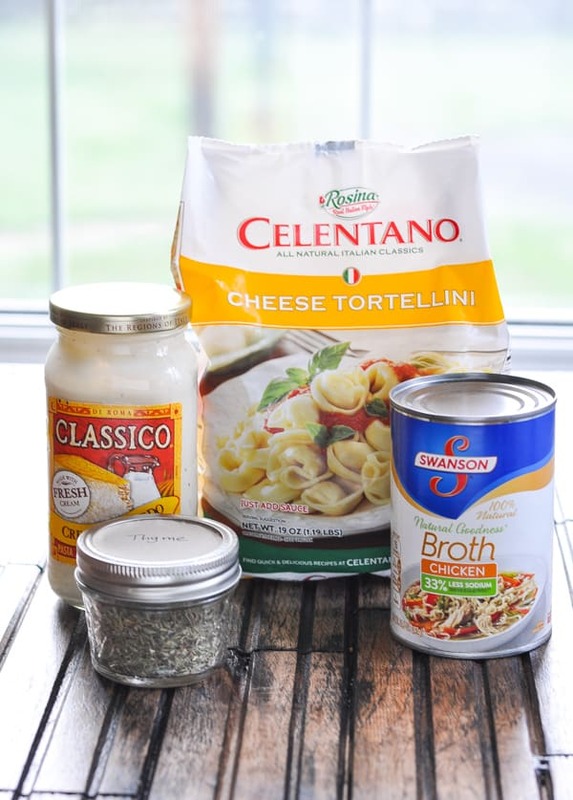 You’ll need a bag of frozen cheese tortellini, two jars of creamy Alfredo sauce, chicken broth (or water), and dried thyme. Combine these four ingredients and transfer them to a large baking dish. Cover with foil and bake for 30 minutes. 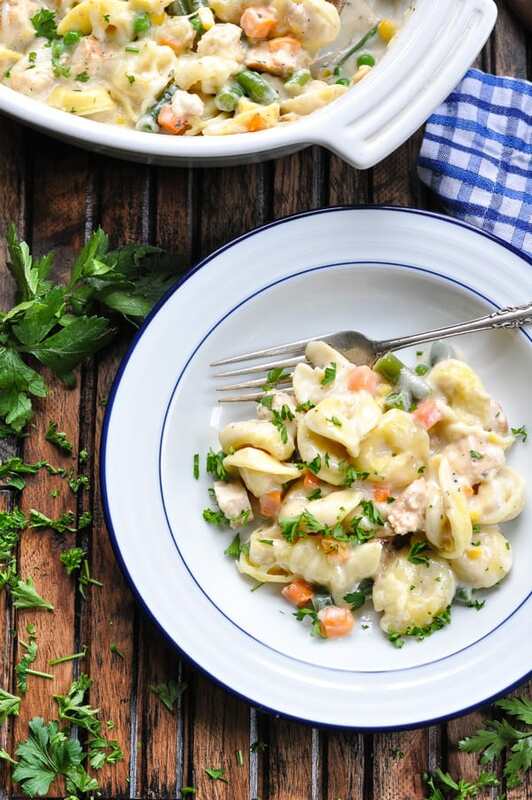 You don’t have to thaw the tortellini before it goes into the oven! Once the pasta is tender, stir in 2 cups of cooked, diced chicken and 2 cups of frozen mixed vegetables. Add a sprinkling of shredded mozzarella on top, pop it back in the oven for about 5-10 minutes, and your casserole is done! The end result is a perfectly cooked one pot meal! By adding the vegetables into the dish at the end of the cooking time, the veggies don’t get mushy and over-cooked. Instead, they stay bright and crisp-tender — which is just how we like them! Everything’s in one dish, so you don’t have to worry about sides, veggies, or bread…which are always kind of an after-thought for me, anyway. Best of all, everyone loves this meal. It’s a rare gem when I find a simple, easy solution that makes all 5 of us happy! 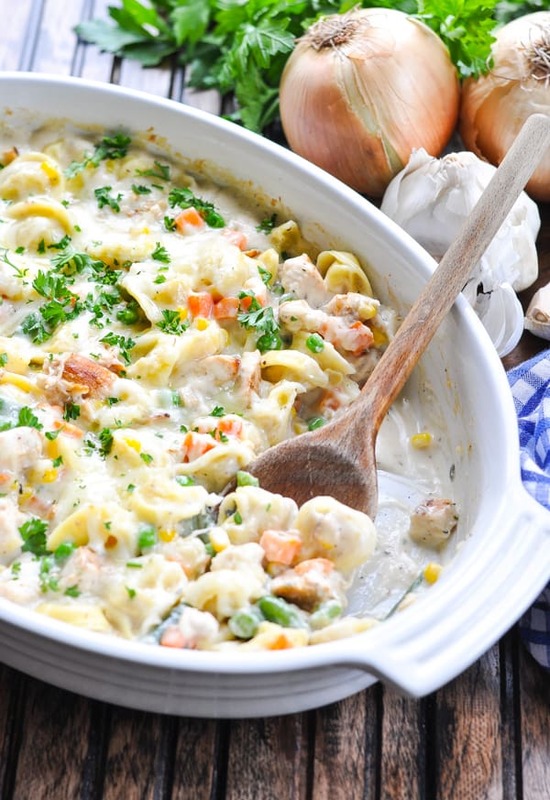 Do NOT thaw the tortellini or the vegetables before adding them to your dish. I have NOT tested this recipe using fresh or refrigerated tortellini. It might work, but the fresh or refrigerated version will have a different cooking time and may not absorb as much liquid. 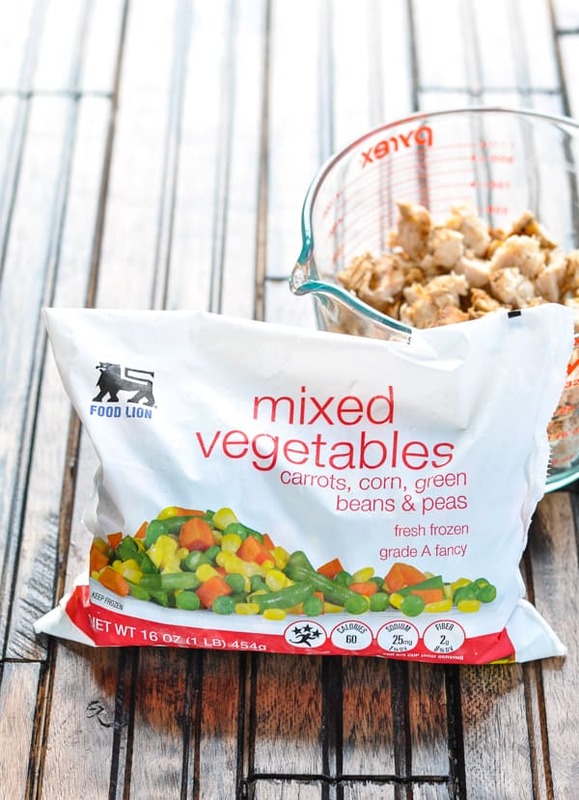 I used a blend of mixed vegetables that included peas, carrots, corn and green beans. You can substitute with any of your family’s favorite vegetables; however, please be aware that larger vegetables like broccoli florets will require a much longer cooking time (so just add them to your casserole at the beginning). I used leftover grilled chicken here, but you can use a store-bought rotisserie chicken or other store-bought pre-cooked chicken like Perdue Shortcuts or Tyson Grilled n’ Ready. Looking for a lower sodium option? You can substitute with 3 cups of homemade Alfredo sauce so that you can control the amount of salt used in the sauce. The texture and flavor of the dish will be different, though. Cooking for a smaller family? Cut the ingredients in half and bake the casserole in an 8-inch square pan. The rest of the instructions remain the same! What else can I make with cheese tortellini? Preheat oven to 425 degrees F. Spray a 9 x 13-inch baking dish with cooking spray and set aside. In the prepared dish (or in a separate bowl), whisk together frozen tortellini, Alfredo sauce, chicken broth (or water) and thyme. Cover tightly with foil. Bake (covered) for 30 minutes. Remove dish from oven, stir. At this point, the pasta should be tender (or almost tender). Stir in the chicken and the frozen mixed vegetables. Sprinkle cheese on top. Return dish to the oven, NOT covered, for about 5-10 more minutes, or just until vegetables are tender and cheese is melted. I used a blend of mixed vegetables that included peas, carrots, corn and green beans. You can substitute with any of your family's favorite vegetables; however, please be aware that larger vegetables like broccoli florets will require a much longer cooking time (so just add them to your casserole at the beginning). I used leftover grilled chicken here, but you can use a store-bought rotisserie chicken or other store-bought pre-cooked chicken like Perdue Shortcuts or Tyson Grilled n' Ready. This post was originally published in December, 2015. It was updated in November, 2018. What a delicious casserole! I have no doubt that my husband would just gobble this down. Love how hearty it is! Yep, it’s definitely man-friendly food, Gayle! what a comfort dish! love the creamy sauce. Can i have it for breakfast? I made this tonight – and it was DE-LISH. And super easy! The cream sauce is simple and very good – especially for a family that is into the simple ‘meat and potatoes’ type of meal. I put a little less cheese, because our family usually doctor’s up our own plate before we eat. I also used cut up mozzarella string cheese as we didn’t have any shredded Mozzarella – those turned out to be melty and delicious as well! Wonderful! I’m so glad that you enjoyed it, Brittany! Thanks for letting me know! This recipe is a gem! I love it. It’s going to be a regular for sure. My boyfriend is obsessed! He said he wouldn’t be upset eating this every day! Haha so guess what we are having again tonight for dinner?! I’m going to give it a try with raw fresh veggies instead of frozen this time and see how that turns out. Thanks so much for your effortless but still delicious meal idea! Yay! I’m so glad that your boyfriend approves! 🙂 Thanks, Ashley!